Missile Troops and Artillery Day is a professional and memorial day in the Russian Federation and the Republic of Belarus. It's annually observed on November 19. The first observation of this day took place in 1944, when it was established by the Supreme Soviet of the Soviet Union decree on October 21, 1944. The date was chosen to be November 19 to commemorate the start of a successful counterattack Operation Uranus, conducted by the Red Army during the Battle of Stalingrad. 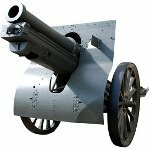 The artillery played an important role in the outcome of the battle, that is why original memorial day was named Artillery Day. In 1964, the observance adopted its current name. After the collapse of the Soviet Union many newly independent states canceled this day or moved to another date (for instance, in Ukraine the date of the observance was moved to November 3). The governments of the Russian Federation and the Republic of Belarus decided to re-initiate the day and keep the original date.